News of HP's Firebird 803 may have leaked out over the holidays, but now that its been officially announced, we have a batch of photos, including the freakishly tidy insides, as well as pricing details. As you can see, HP put some work in getting the internal layout of the Firebird to be as simple and clean as possible. A couple of interesting details not revealed in the leak are that the Firebird actually has 3 GPUs—two discrete Nvidia cards in SLI configuration for performance needs only, and one integrated GPU for Windows to run on. The external power supply is a big reason why the machine is 80% less power hungry than most gaming PCs, while the hot-swappable drive bays and sub-30db noise level are also nice touches. But even more impressive is the price. 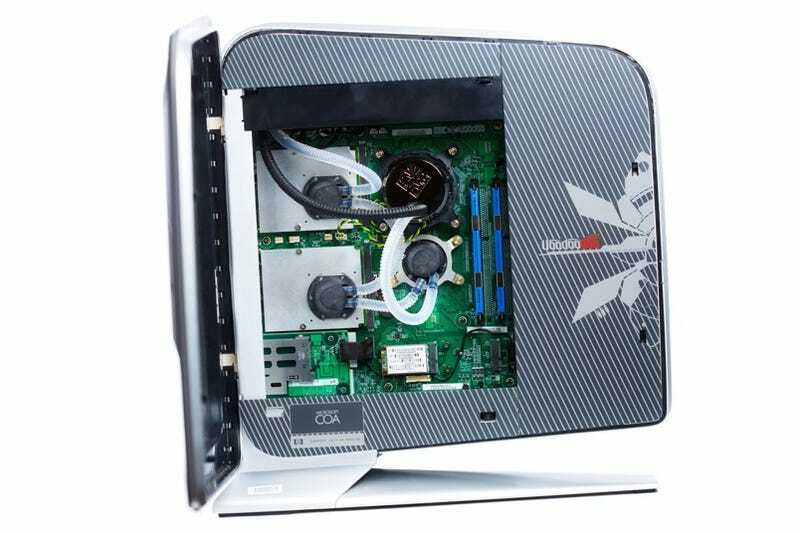 Considering you're getting a 2.83 GHz Core 2 Quad, 640 GB of storage, Blu-ray, 4 GB RAM dual SLI graphics cards and liquid cooling, it's not bad that the Firebird 803 will only run around $2100 when it becomes available. There will also be a Firebird 802 available which will lack the Blu-ray and only have 500 GB of storage for $1800.